Kim Shelton inspects the bark of a cedar tree which was cut and left in a cut block on public lands in mountain caribou habitat in the southern Selkirks of British Columbia. My love of working with cedar bark was sparked years ago when I took a hat weaving class from the Snoqualmie tribe, the indigenous people from the Snoqualmie river valley in western Washington where I currently live. The Snoqualmie held a public class at their tribal office taught by ethnobotonist and author Heidi Bohan, to teach anyone who was interested the complex traditional art of cedar bark weaving. When I touched the warm, wet, flexible, and unbelievably strong strips of inner bark of the cedar for the first time, I fell in love. It reminds me so much of leather every time I work with it--it truly is the skin of the tree. The reverence with which the cedar bark is handled during weaving is inspiring. For some items the long strips of bark must never touch the ground, instead being wrapped countless times around the weavers neck and shoulders in many loops. Since that class I have harvested cedar bark myself, going out in the spring to carefully pick a tree, cut into the bark and push my hands into the slippery space between the wood and the inner bark. To pull the bark from a cedar is an intimate experience, it cannot be done without taking something from the tree—without hurting it. And yet, when harvested carefully, the tree will survive, though forever with the scar of what you have done. There is an exchange between the weaver and the tree: the human is taking some of the trees beauty, but in return is left with the responsibility to create something just as beautiful with what has been taken-- a relationship between people and the tree which built on a foundation of respect. I always leave something for the cedar when I strip it, an offering or a prayer, to say thank you. One time, a song came to me, so now I sing to them every time I harvest bark. A recent cedar bark harvest. Traditional harvesting methods dictate how to harvest bark and how much should be taken from any particular tree in order to protect the overall integrity of the tree. 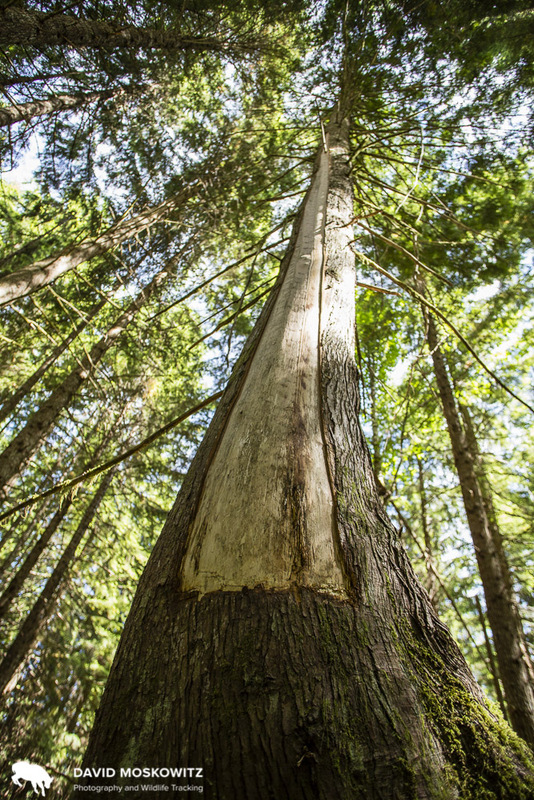 The scar from such bark pulls can last for hundreds of years on these long living trees, a reminder of the long standing relationship between people and cedar trees in the Pacific Northwest. Cedar bark carefully harvested from a young cedar tree (seen in the background) in Washington State by Kim Shelton. Photo by Kim Shelton. Heidi taught me that for the Snoqualmie people the western red cedar is a sacred tree, as it is for many of the indigenous peoples of this part of the continent. One of its names is the Tree of Life, because for the people of the Pacific Northwest it was used in almost every aspect of life, from construction of houses and canoes and rope to haul whales in with, to baby diapers and clothing. The fronds are full of volatile oils, making it a strong medicine during cold season. It is naturally antifungal, making it the perfect material for life in the damp rainforest. The cedar tree is also a healing tree, healing to the soul and the heart. I have been told that just to stand with your back against a cedar tree will give you strength. I have found this to be true. 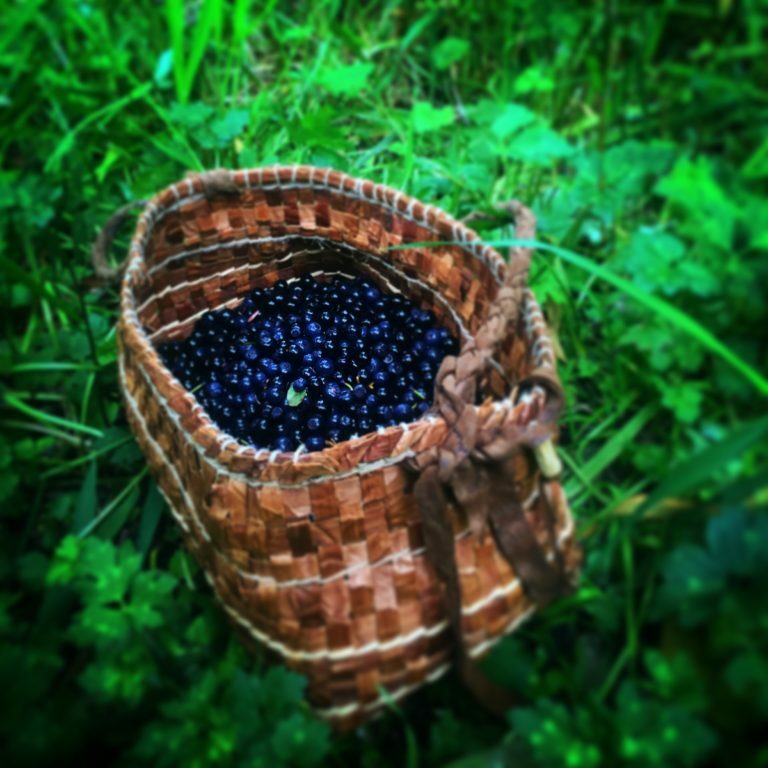 A cedar bark basket made by Kim Shelton filled with huckleberries. Photo by Kim Shelton. The colonial culture of European Americans who came to this region developed a very different relationship with the cedar tree. As a part of the Mountain Caribou Initiative, we try to find caribou, and this involves walking and driving by many, many clearcuts in the inland rainforest where these animals live. Every time I see a clearcut I am struck by the waste that is left behind. But recently, in the Southern Selkirk mountains of British Columbia, I came across something which, to me, felt not just wasteful, but unbelievably disrespectful from the perspective of how I was taught to care for the gifts that cedar trees have to share with humans. In the corner of a recent cutblock Dave and I wandered through on our search for caribou, I walked up to multiple giant cedar trees that had been cut at their roots and left to rot on the ground. The bark was falling off like dead skin. Some old trees are cut and found to be rotten in the inside, and so are left behind because they won’t make a profit. But these trees didn’t have that, and for the life of me I couldn't come up with a reason why they had to be cut and left. Are these forests worth protecting for their own sake? Or does the western mindset need an endangered warm-blooded creature like mountain caribou to empathize with in order to inspire protection for what we see simply as habitat for an animal? If these caribou disappear completely, so will the limited protections they have provided to these forests in British Columbia. Will our society learn to see the forest for the trees before we have completely squandered the amazing natural heritage this part of the planet has been blessed with? A heritage and resource the original human inhabitants recognized and stewarded with so much care for thousands of years before the arrival of Europeans and global capitalism. Like the remaining uncut inland rainforest, and the last herds of caribou who now defend them, the wisdom and reverence the first people of this region have for both trees and animals hasn’t disappeared completely. Perhaps to protect these forests and caribou, we must also restore a relationship between the forests and the people built on mutual respect and a covenant which is built on the understanding that the forest cares for the people and in return the people care for the forest. The interior rainforest of the Pacific Northwest in many ways resembles the more well known forests of the coasts, though it is even more rare, being the largest and most interior such forest left on the planet. Towering western red cedars loom over an understory of devil’s club and other plants typically associated with coastal landscapes. A rare stand of middle elevation old growth cedar-hemlock forest in the Southern Selkirks. This forest is protected within the Nature Conservancy of Canada’s Dark Woods Preserve, set up specifically to protect mountain caribou habitat. “The cedar tree is also a healing tree, healing to the soul and the heart. I have been told that just to stand with your back against a cedar tree will give you strength. I have found this to be true” says Kim Shelton, here seen doing just that on a cedar tree on the edge of a recent cutblock in the BC Selkirk Mountains. Just down the road, Dave and I found caribou tracks exiting another clearcut. In light of the incredible efforts by the province of British Columbia, First Nations, and conservation groups to protect inland temperate rainforest for the fragile mountain caribou population, seeing such clear evidence that their habitat is still being destroyed is confusing. It is even more confusing to realize that, in the process of destroying this sensitive habitat and globally unique ecosystem, we are wasting of the amazing bounty of these trees. And this is within the context of the deep reverence the original human inhabitants of this region hold for these amazing forests. Kim Shelton stares up at a huge western red cedar tree. The magesty of the inland temperate rainforest is something that is striking in its own right, beyond the immessurable biological value of these forests. Fenger Memorial Grove, Trout Lake, British Columbia.